Protesters against the closure of the inpatient ward at Rothbury Community Hospital. The shuttered hospital ward at Rothbury will remain closed for now, but it has been concluded that the consultation was flawed and more work must take place locally on the next steps. The 12-bed inpatient ward at Rothbury Community Hospital was closed – temporarily at first, it was claimed – in September 2016 due to low usage, but to the dismay of the community, who opposed it vociferously. In May this year, the matter was referred by Mr Hunt to the Independent Reconfiguration Panel (IRP), a non-departmental public health body, which has now issued its response. 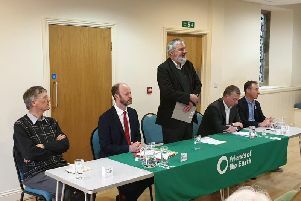 The panel has provided advice over what needs to be done next, which has been accepted by the new Secretary of State, Matt Hancock. Coun Steven Bridgett, the ward member for Rothbury, described it as ‘not the best of responses but definitely a ray of light’. He added that, due to the consultation being flawed, the community may also have grounds for a judicial review, particularly if the CCG does not engage meaningfully with residents on the potential of having the beds as part of the proposed health and wellbeing centre. A spokeswoman for the CCG said: “We have received a letter from the Secretary of State for Health with the advice of the Independent Reconfiguration Panel concerning the proposed changes to Rothbury Community Hospital. “Having considered the IRP’s advice, the Secretary of State has notified us that further action is required. “The CCG now needs to consider this advice and hold discussions with Northumberland County Council and Northumbria Healthcare NHS Foundation Trust over the coming weeks. In the meantime, the inpatient ward will remain closed until further notice. Coun Jeff Watson, chairman of the council’s health and wellbeing committee, said: “We welcome the response from the Secretary of State. “However, the official response letter has as yet not been received by me and we have only today been informed by email of its contents. The CCG and committee should focus on those most affected, to consider the impact on families and carers of travelling further afield and to engage fully with the community as the health and well-being centre is developed. Consideration of the option of reopening the inpatient ward must form part of this work.